Building on its success in replacement components for YORK chillers, Johnson Controls HVAC Parts is to distribute Hitachi air conditioning split systems in the UK. 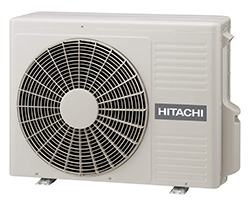 Contractors and installers will be able to purchase Hitachi’s high efficiency Summit air conditioning units via Johnson Control’s EasyParts website. New customers without trade accounts can purchase equipment with a credit card, speeding up order and delivery. Product manager at Johnson Controls HVAC Parts, Alpesh Trivedi, said: “The diversification into air conditioning splits is a logical development, and a good complement to our established and growing business in the chiller sector. The Hitachi Summit range of split systems covers models with nominal cooling capacities from 2 to 5kW and heating capacities from 2.5 to 6kW. Units are equipped with DC inverter drives on compressors and fans, resulting in an A+ energy efficiency rating for all models. Designed for use in small commercial and residential applications, the use of inverter control ensures output is matched precisely to current load and ambient conditions, reducing running costs and delivering very low sound levels. Units feature a heating mode lock, making them suitable for use in BREEAM-assessed buildings where cooling mode may not be acceptable, or in applications where cooling is not required. Johnson Controls has set up a dedicated team to support the new Hitachi air conditioning business to help customers with technical and order queries. Rapid delivery times of between three and five days will be offered. The company will take responsibility for warranties. As an added incentive, installers ordering a Hitachi Summit unit before September 15 will receive a multi-function tool free of charge. It consists of a 13-function tool and incorporates a 9-LED torch.